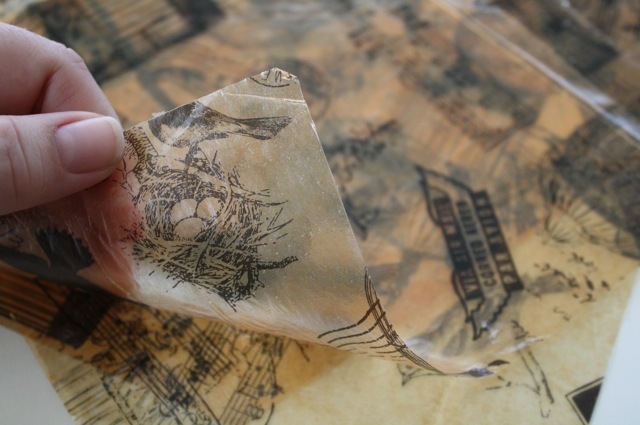 So today we're exploring turning Collage Tissue into paper. To do that you need to coat the Collage Tissue with a product. I tried a few (you can find more results at the bottom of this post) but I'm going to show how use Ice Resin which worked the best in my opinion for what I wanted. Put on your goggles...and let's get started. Lay the plastic garbage bag on the table. I used a piece of clear plastic over my Anthropologie tablecloth because I thought it looked better for the pictures but you are welcome to use whatever piece of plastic you like. Oh, and you don't really need goggles but maybe an old shirt or apron for this one. Cut a piece of College Tissue to a workable size and lay on plastic. NOTE: I cut a few pieces of tissue. I figured, if I was going to go to all the trouble to mix resin then I might as well make a few sheets at a time. First of all I am not an expert in using Ice Resin. But I will tell you what I do know and if you want to try it, you can read the complete directions that comes with the product, fair enough? I hope so. 1. Pour equal parts of bottle A and B into plastic measuring cup. 2. Mix the Resin for 2 minutes with a stir stick. 3. 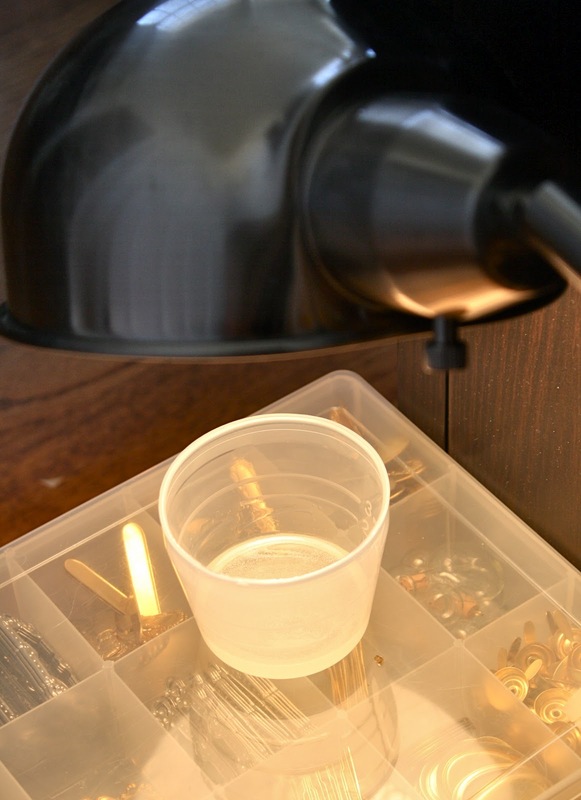 Let Resin rest under a lamp to encourage bubbles to float to the top. 4. 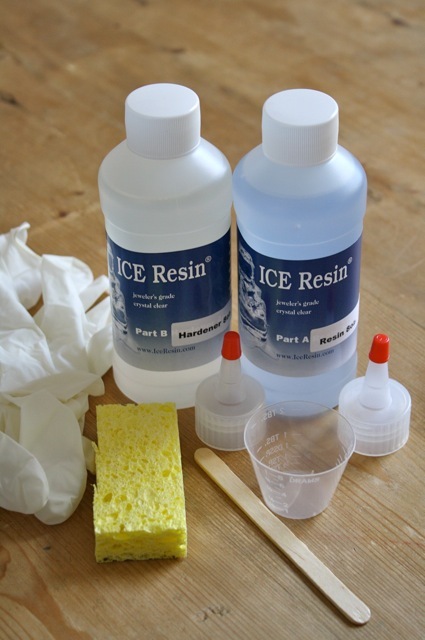 Use a piece of an unused sponge to spread the Ice Resin on the tissue. Note: The first time I tried this I thought I could bypass the sponge and use a foam paint brush. Not so. The sponge is what you need to use unless you want to make the tissue into serious thick plastic and I am not kidding...plastic! Anyway, note taken, stick with the cheap-o sponge. 5. Working very quickly, coat the back of the paper then flip over and coat the front. Sorry the angle of this picture is weird but it shows the tissue on the left and the tissue with the Ice Resin on the right. 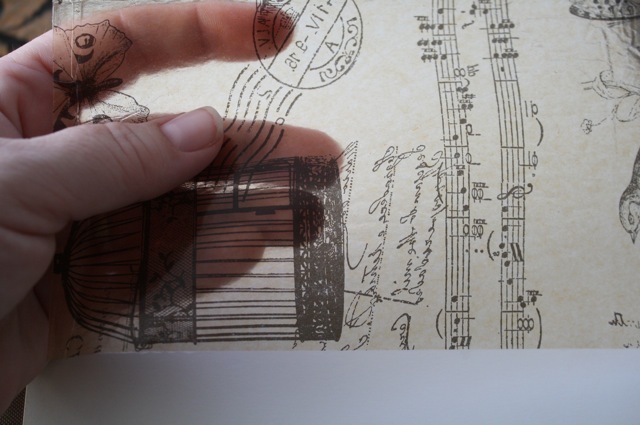 It really becomes transparent. 6. LEAVE IT ALONE for 24 hours. The thicker the coat, the longer to dry, I found it best to just walk away and close the door. Which worked out for me since I did this on the kitchen table. I told my husband, "We have to go out to dinner, my tissue is drying". So here is a finished piece. It might be hard to tell on a computer screen so let me say it feels like thin plastic. Very flexible, sturdy, yet transparent. In my quest for making Collage tissue into more than tissue I did try other products. Here is what I found. Mod Podge - Works as a glue, fine for adhering small pieces. Does not work AT ALL as a coating. Gel Medium - Works beautifully to adhere tissue to something but as a coating, does little to improve the durability. Dries with a strange texture. DG3 Art Gel by JudiKins - I liked this product and the texture it produced on the tissue (probably because it's water based). It was almost crispy. My only problem was replication. I couldn't get it to come out the same exact way twice. So there you have it, my full report. If any of you have experience in this area or you have done this before, maybe you have a tip or trick or even another product you have tried that worked nicely, we would love to hear about it! "We have to go out to dinner, my tissue is drying". This is a great idea. I've used the Ice Resin on old book paper before but not on tissue paper. Thanks for sharing, I'll definitely be trying this out. Now that is a clever use of ice resin. Can't wait to see how you used the paper in a project. I've never heard of Ice Resin but I love the results! Very cool! This is fantastic! Thanks so much for the great tutorial. I'd never heard of this product before and just love the results! can you use epoxy resin for this? also, college tissue??? I have been trying to figure out how to do a jewelry project that required something thin and transparent but not easily damage... this might work out fantastic! Can the finished product be folded in half? I want to do this for a pamphlet style book I am making. and what can this be used for? I'm curious! So cool!